Here's a valuable and comprehensive review on one of the most glaring pieces of evidence for why drug discovery is so hard - the fact that very small structural changes in molecules can lead to drastic changes in their biological activity. I particularly like this review because it's absolutely chock-full of examples of small structural changes which not only impact the magnitude of binding of a small molecule to a receptor protein but invert it - that is, change an agonist into an antagonist. And the receptor family in this case is GPCRs, so it's not like we're talking about a minor rash of examples in a scientifically insignificant and financially paltry domain. Here's one of my favorite examples from the dozens showcased in the piece; in this case a set of small molecules targeting the nociceptin receptor which is being studied as a potential target in treating heart failure and depression. At first sight it's compelling how such similar groups as a cyclooctyl, a cyclooctyl-methyl and a phenyl can lead to complete inversion of activity, from 200 nM agonism to 1.5 nM antagonism. Thinking in 3D however makes the observation a bit more comprehensible. The N-cyclooctyl on the right is going to have a very well-defined conformational preference - pointing pretty much straight in one direction. 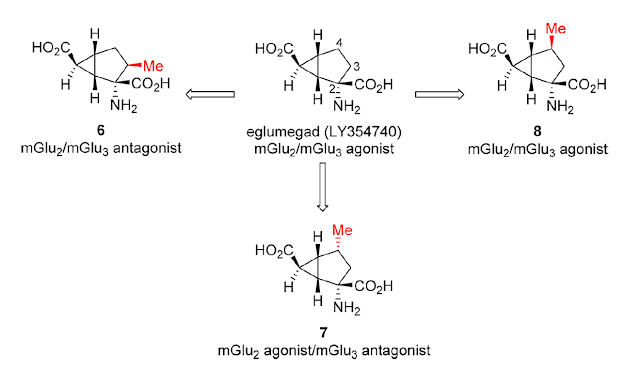 The cyclooctyl-methyl on the other hand is going to have much more conformational freedom. It's also going to occupy much more space than the phenyl group on the right. Here's a more diabolical example that would have been even harder to predict. In this case the target concerns two suptypes of the mGlu (metabotropic glutamate) receptor which is involved among other things in Parkinson's and anxiety. In this case, not only does that 'magic' methyl group and its precise stereochemistry change an antagonist into an agonist but it even changes the agonism/antagonism mix at two separate receptors. Try explaining that, even in retrospect. These kinds of well-known activity cliffs reinforce the essentially non-linear nature of medicinal chemistry, a quality that is essentially emergent since it arises from the interaction of small molecules with a highly non-linear biological system. Neither experimental chemistry nor computational modeling would allow us to predict activity cliffs like these because of the lack of sensitivity in such techniques. It's things like these which I always think really need to be communicated to laymen to impress the staggering difficulty of drug design to them - most of the times we are simply ignorant when it comes to designing molecules like the ones above with any kind of predictive power and we can only find out about their fickle properties in retrospect. Perhaps then we will get less heat from the public for why we sometimes have to spend (and charge) so much money for our products. And that's without even considering functional bias in the GPCRs and the balance between G-protein and beta-arrestin activation. Not only don't we know a lot, we don't even know that we don't know things. Absolutely; that's a stew cooked in a wok embedded in a crock pot.